The Pop In Place is looking forward to holding the third Happy Memories Café on Monday 3rd September. We have an Old Bere Regis Photographic Exhibition in the Lower Hall with Paul Bennett, we have recently uncovered some new and never seen before images of the Village in the 1950’s so that is really exciting news. In the Upper Hall there will be a cafe setting ,homemade cakes and refreshments available during the morning, Terry Bryant will be entertaining us and he is bringing along his Pat dog Izzy. There will also be an opportunity for anyone who is worried about memory loss to speak to Lisa Holmes the Memory Advisor from Age UK. There will be a warm welcome to all. Transport is available from within the Village contact Max Saywell to make you arrangements. The Exhibition is free of charge but donations to the Alzheimer’s Society will be very much appreciated. We have had a wonderful morning with Darrell Wakelam making amazing treasure chest, twenty six Bere Regis youngsters were given the chance to get creative. 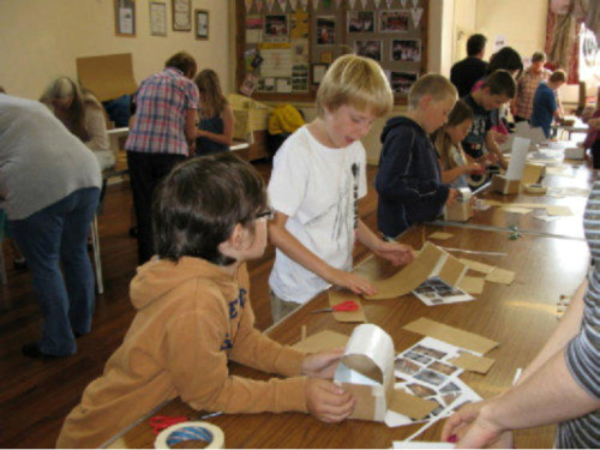 Many thanks go to the Thomas Williams Educational Trust who have helped with the funding for this and enabled us to offer it to the community free of any charge, allowing young people to have a lot of fun and greatly enjoy the workshop. Thank you to all the Pop In Place volunteers who assisted with the morning, we are so lucky to have such a dedicated team who are willing to give up their own time to give opportunities to others. We are in need of some new helpers for Monday’s Pop In Place Sessions as some of our volunteers have either moved on or others have got jobs. This has left us short staffed for our Monday sessions that are really valued by a lot of our more senior clients and they do really enjoy attending. If you are interested in becoming a volunteer in your local community making tea's or helping to sale the new to you items and the bric a brac or just generally welcoming people and sitting and chatting please give me a call 01929 472023.